and grandchildren. And my brother Jack. Harbor House Cafe in Dana Point. I have been back in the States now for about 7 weeks. It's good to be back home, but I am overwhelmed at the moment with culture shock (anticipated, but a little tougher than I thought) and the big elephant still left to bite off...assimilating back into the USA. I believe it was easier adjusting to Ecuador six years ago, than it has been to move back to the States. It's been GREAT seeing my kids and grandchildren again!!! That's the good part, and has made this transition all the more worth it. I mentioned before that my three daughters (and five grandchildren, with a sixth one on the way shortly) and I have lived in four different countries for the last six years, but one daughter and family who were in England for 13-yrs also just recently repatriated back to the States, and I finally got to meet my almost 3-yr old British twin grandchildren (Isobel and Levi). And I have had the chance to get reacquainted with my oldest granddaughter (Avery) who was nine years old when I moved to Ecuador, and is now so grown up since we last had time together. "Little" Moments in life that mean a lot. They don't have them in England. Such a joy to watch their joy. The view from my brother Jack's home. Where I landed for first few weeks. The dichotomy between living in a small, rural coastal Ecuadorian fishing village for six years, and life back in the USA is vast –particularly since my initial landing pad was in Orange County, California. The pace of life, the amount of material wealth, the well-manicured neighborhoods has found me baffled and bewildered. The Sun sets in the wrong place (further north than I am used to). The night time boat lights I see from Laguna Beach view are not "simple" fishing vessels. Miss the roosters (honestly). I miss those noisy little bastards. I expected this to a degree, but I feel like I landed in the land of the “Jetson’s”. Not to mention all the changes in technology since I last lived here. Within the first few days of returning to States, I went to a Target store to shop with two of my daughters here in California, and various grandchildren. The Target store was bigger than the town of Olón (and I used to breeze through Targets and Walmart’s with ease). I was only shopping for a billfold and purse that day, but became near tears from the plethora of choices available. And that was just shopping for a WALLET. I knew ahead of me – quite quickly – was the need to buy a car, a USA smart phone, and a new laptop (to replace the 4-yr old Toshiba I’ve been using that has no working keyboard, and only one external working port – tough as a writer with those limitations) to launch this new journey. To say that getting “up-to-speed” would be an understatement. 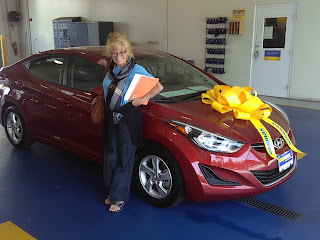 I began by buying a cheap Walmart “smart phone” (that is smarter than me, and still reading that instruction manual), than segued way into buying a car (I don’t know much about cars, but did a lot of on-line research to determine what to buy before purchasing one). And happy with the car I bought from CarMax (and reading the instruction manuals on that as well). Feel like such a hick and rube. One afternoon, shortly after I returned, I went to my Orange County storage area (which contains mostly sentimental stuff I kept, when I moved to Ecuador) to clean up files, and condense a little more). The guy working there closed up early without realizing I was still in the storage complex. Nice guy. Not his fault; he did do final golf-cart run through, and didn’t see me dumping trash into bin in the very back of the complex. When I went to gate to leave (around 5:25PM) the automatic locking gate didn’t open. Codes don't work on keypad after 5:30PM --- until 8AM....The storage guy had already locked the pad and left a little earlier. The only number I had was the office number, but of course, no one was there. No emergency number or ADT to call. Was totally flummoxed...And I wasn't sure of my exact location address (though I eventually found it). And because of my claustrophobia, even though I was locked in an outdoor area, this triggered my brain to think I was dying of thirst, and of course, I had no water with me (which after six years in Ecuador, I am in habit of having on me, along with toilet paper – but not on me that day). Didn't know whether to call Pizza Hut for delivery, and settle into my car backseat for the night, or call the police. After about an hour of frantically calling any number I could think of (went back to my storage unit to pull the storage unit file to find any number that might help). They were really nice and understanding. I was supposed to have beer and dinner with my middle daughter and grandchildren, and had to cancel/explain reason. I did get there later in the evening and we all had a good laugh. However, I knew I could not afford, nor desire to live in Southern California again, and as soon as possible after buying the car, seeing kids again, taking care of business in California, hit the road for new destination...I think New Mexico is calling to me. (Please note the date on this essay. I wrote it several weeks ago, and only now getting it to post because of adventures -- should probably say "mis-adventures" on this journey to find a new home, but more on that later). It's good to know there are people who I may know there. I would love to meet you in person! I am in Las Cruces now, but heading your direction. Santa Fe is big on my radar for a new home after my exploration trip through there last year, during a visit to the States. I can't even fathom trying to settle in again. I have been going back to mom's twice a year for two weeks (as you know) and that just has me exhausted, and ready to come back to my peaceful life here. Good luck in New Mexico. Can't wait for your update on your findings there. I knew to expect a LOT of adjustment on re-entry...but still..it's been more than I expected, to a degree. And so glad to know I'm not the only one who was overwhelmed to tears over the abundance of choices in stores. I used to whiz through super Targets...still getting adjusted to stuff like that. Too funny. Thanks for the laughs and giggles...your blog just popped up. We're staying in Rio Chico, down the road from Olon, for a month. We've been living in Ecuador a year- have four children, five grandchildren and one on the way...just like you. Our youngest grandchild (age 9 months) is named Avery. :) I just went back to the States a couple of months ago and gained 10 pounds in 6 weeks! I hope to do better next time. It was all worth seeing the children and grandchildren. Thanks for your blog :) I can totally relate. I wish we would have had the chance to meet before I left. Sounds like we just missed each other. I'm enjoying your FB posts as well. (Great picture of the whales on the "Ruta del Sol Mates page, by the way). Congrats on your family and grandchildren (I have a granddaughter named Avery too). And I'm pigging out now too -- so great to dig into good Mexican food again!